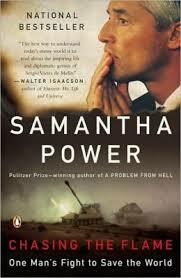 In Chasing the Flame (Penguin, 2008) Samantha Power, who is now U.S. 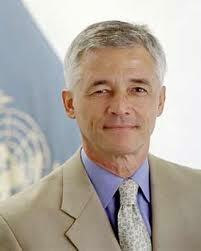 Ambassador to the United Nations, gives us the enthralling, inspiring, and maddening story of Sergio Vieira de Mello. An international crisis man sometimes described as a humanitarian James Bond, Vieira de Mello was a brilliant and deeply humane UN diplomat whose combination of passionate idealism with hard-nosed pragmatism was repeatedly frustrated by forces larger than himself, including the shortcomings of his own organization, the UN. His was a thrilling life prematurely ended in 2003 by a bomb in Baghdad while he served as the UN chief of mission in Iraq. This diplomat, who shuttled from one conflict zone to another to defuse international crises, was not only a man of action, but also a man of deep thought, a man after philosophy. A brief statement from early in his career reveals that for Vieira de Mello, philosophy not only provided the internal grounding for the bold pursuit of justice to which he devoted his life, but was also at the core of what makes us human. In his words below, he also echoes the ancients’ (was it Plato? It was probably Plato) insight that just as those who are most gifted have the greatest potential for good, they also have the greatest potential for evil. We’re reminded that this applies to the realm of thought and ideas as well.